Where have all the dockless bicycles gone? Data from DC’s pilot is revealing. Image by Joe Flood licensed under Creative Commons. Last month, DC's dockless vehicle-share pilot hit its one-year anniversary, and the participants look vastly different than they did this time last year. In 2017, all dockless providers operated using only pedal (Lime, Mobike, Ofo, and Spin) or electric-assist (Jump) bicycles. In a span of less than six months, 96% of the freestanding dockless pedal bikes (DoBi) on DC streets have disappeared and currently, the pilot is almost all electric bikes and scooters. I crunched some dockless data to try to figure out what happened to the pedal bicycles. 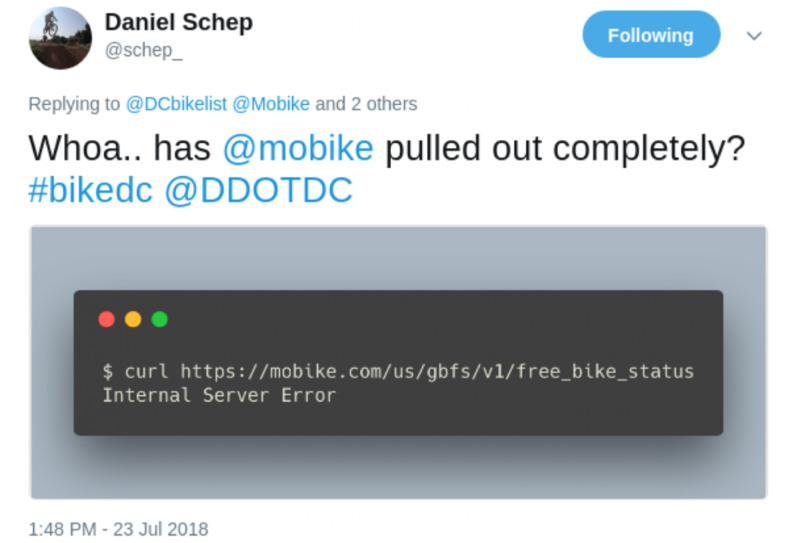 I used public API data from each of the original DoBi operators collected by Daniel Schep for the DC bike finder web app from mid-February to mid-September to explore the disappearance of the pedal DoBi. 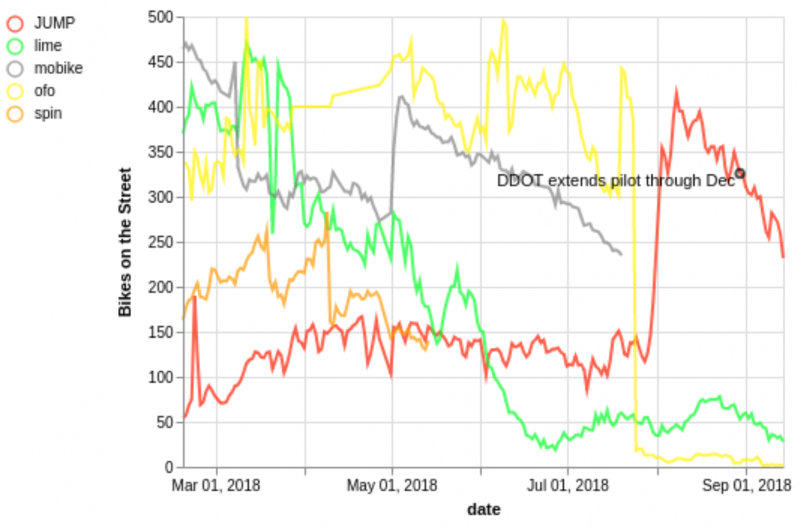 I’ve created a timeline of key dockless pilot events to try to explain how and why each operator left the DC market, and added these events in the following graphs for context. The most notable events in the timeline above are the two DC Department of Transportation (DDOT) dockless pilot extensions in April and August, and the flurry of exit activity at the end of July by Mobike and Ofo. The second DDOT pilot extension lasts through the end of 2018 and imposes a new rule that all bikes must be locked to a fixed structure. This timeline gives useful context for the DoBi provider data. What caused the demise of the pedal DoBi? Chinese operators: Ofo and Mobike were heavily vested in international markets, and found the opportunity cost for operating in most US markets too high due to restrictive dockless pilot rules imposed by city governments, including in DC. 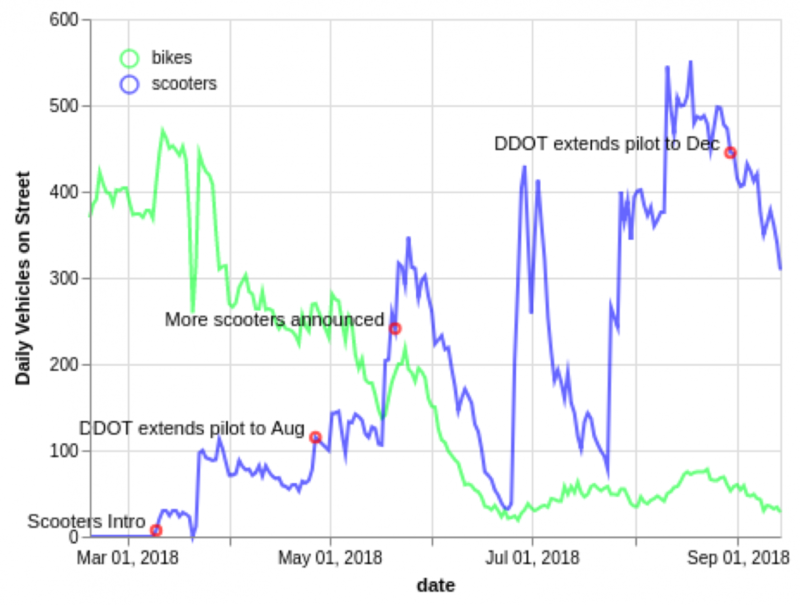 Rise of the scooters: Scooters have been cited as being more popular and providing higher marginal revenue when compared to pedal DoBis, which led Lime to convert most of its fleet and Spin to exit completely and retool for an all-scooter fleet. DDOT pilot extensions: DoBi operators signed up for an eight-month pilot that was originally set to end in April. Assuming the pilot isn’t extended for a third time, the dockless pilot will have lasted 15 months when it ends in December. With only 400 total vehicles allowed on the street, operators felt they could not sustain a pedal bike presence for this extended period of time. The second pilot extension also outlawed freestanding DoBis, all but sealing their fate. Here's how I sussed this out. Ofo was the first large scale DoBi operator in the world, and Mobike was the first DoBi operator in DC. Both operators are headquartered in China, have vast international operations, and left DC market along with many other US markets within days of each other at the end of July. These similarities aside, each operator handled its departure from DC differently. 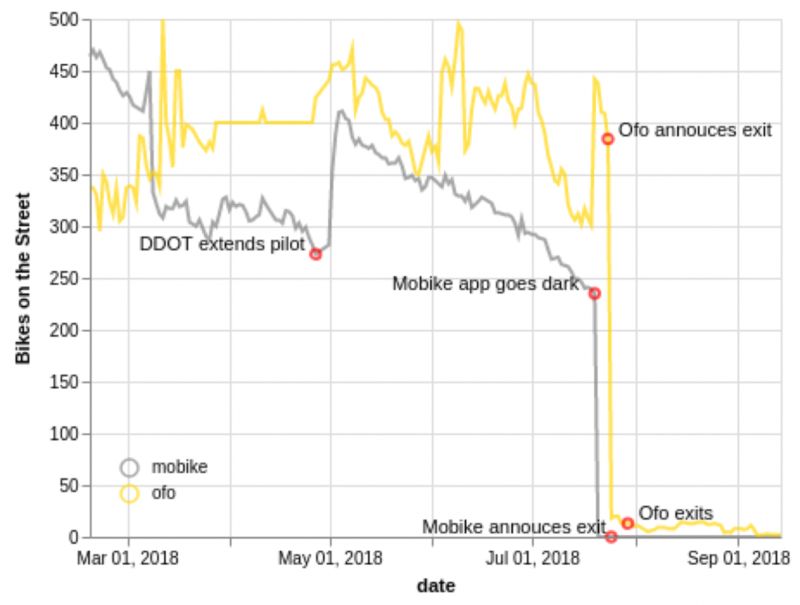 Ofo maintained about 400 bikes on the street until 7/24 — the day of their DC exit announcement. Interestingly, Ofo increases its fleet to 450 bikes several days before announcing their exit, which points to a relatively sudden decision to leave DC. Once the announcement is made, the number of Ofo bikes drops immediately from 400 to 18. In contrast, Mobike gradually pares down its fleet over several months. On April 27, DDOT announced the extension of the dockless pilot through August, and over the following week, Mobike increases its fleet from 275 to more than 400 bikes. From this point on, Mobike allows its fleet to gradually decrease, dipping below 250 bikes as of July 20 when the Mobike app goes dark — four days before it announces its exit from the DC market. When Lime introduced dockless electric scooters on March 10, 2018, this proved to be the first chink in the armour of the pedal DoBi. The number of Lime bikes steadily declined after this point, while scooters steadily increased until they overtook bicycles in mid-May. 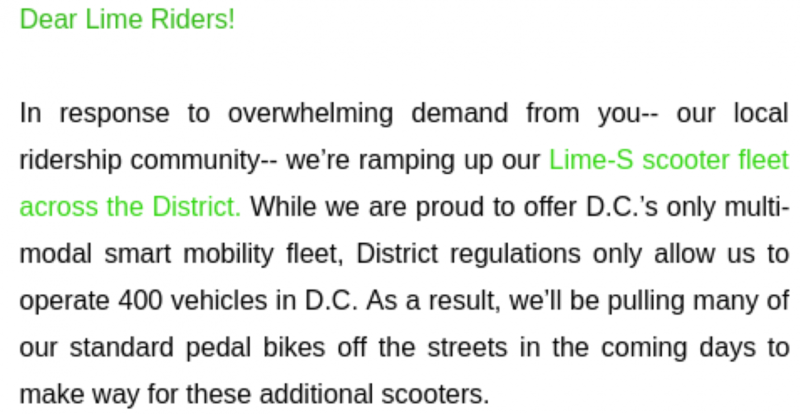 That’s only a few days before Lime announced it would ramp up its scooter fleet, citing overwhelming scooter popularity. The average Lime scooter introduced from March to mid-August lasts only 23 days on the street, as seen by the large swings in Lime’s scooter fleet in June and July. Lime tried to combat this issue by exceeding the pilot-mandated 400-vehicle cap in August, but there is still a significant drop in the fleet over the the first two weeks of September. Over this time period, Lime used at least 1,885 scooters — replacing the scooter fleet 4.5 times!! Please note that from March to June, the number of bikes and scooters are the street are largely estimates. 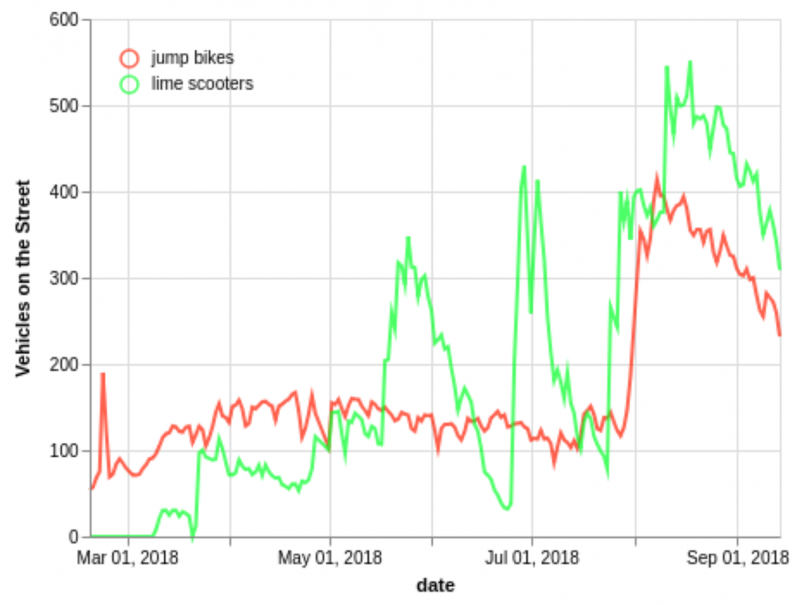 Lime did not differentiate between the two vehicle types in its API until June, so I applied a proportion of known bikes and scooters to estimate the unknown vehicle population for this time period. Spin reacted to the perceived popularity of scooters by completely pulling out of all markets in mid-August to retool its business model. Due to a bug in the Spin data collection process, I only have data through mid-May, so I’m unable to properly analyze the time period immediately before Spin’s departure from DC. Based on the data I have, I can state that Spin averaged about 200 bikes on the street, while its pedal DoBi peers averaged at or above the the DDOT-mandated 400-vehicle cap. Spin allowed its fleet size to dip below 150 bikes a few days after DDOT extended the dockless pilot to August. I can’t draw any definitive conclusions from so few data points, but I would not be surprised if this downward trajectory continued through the summer months. When looking at the current dockless pilot landscape, it’s easy to conclude that that scooters have won out, but Jump’s ascension in the wake of its DoBi peers’ exit is also clear when looking at the data. Less than a week after Ofo and Mobike exit the DC market, Jump surpasses 200 bikes for the first time, increasing its fleet size from 126 to 414. 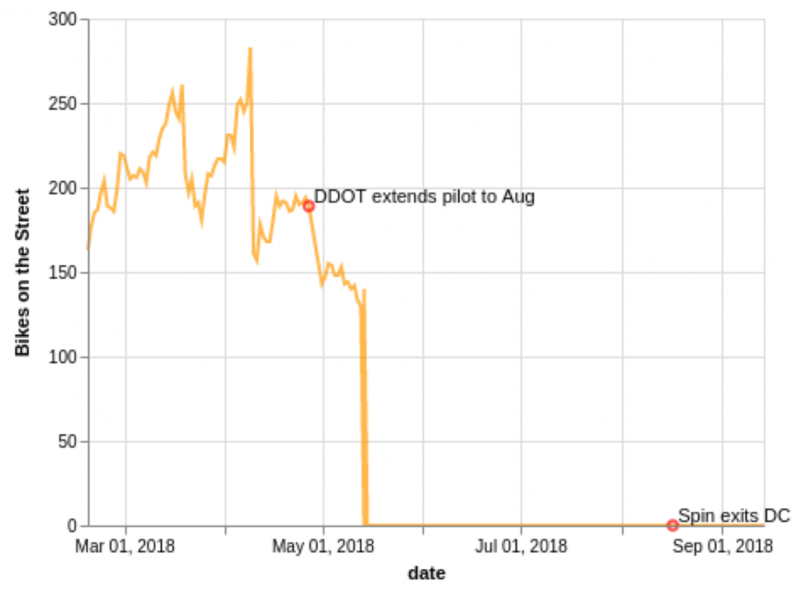 Similar to Lime scooters, Jump is having trouble maintaining a fleet of 400 vehicles, which is illustrated by the similarly sloped negatively lines for each operator starting in early August. This can been seen as a “good problem” for Jump; one explaination is that Jump is enjoying similar popularity as Lime scooters, necessitating additional fleet maintenance and downtime for charging. Readers: Why do you think dockless pedal bikes no longer grace DC streets? Correction: This post previously stated that Ofo was the first DoBi operator in the world. It is the first large scale DoBi operator. Mark Sussman is a DC resident and urban mobility advocate who has been a bicycle commuter in DC for over 12 years. An experienced data analyst, Mark recently earned a graduate certificate in data science from Georgetown and is passionate about applying this skill set to tackle urban mobility problems. When he’s not traversing the greater DMV in search of the area’s best disc golf course (DC proper has zero! ), you can find him on Capitol Hill where he lives with his wife. If you are at the McPherson Sq Metrorail station and head outbound on the Blue, Orange, or Silver Line, what is the next station you will reach? Feel free to ignore station subtitles.